Susan Ferguson took me to Romesco, the day after I arrived in Barcelona, June 1991. It’s an economical restaurant with lots of character and I’m delighted that the entire staff seem to be exactly the same as 20 years ago! 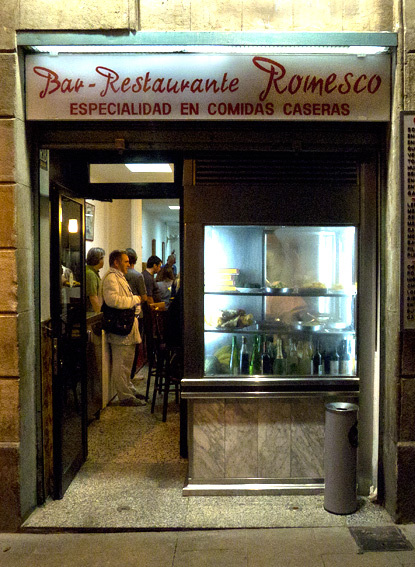 I’ve eaten at Romesco more times than I can remember and it’s my favourite place to eat in Barcelona. I know there are more sophisticated restaurants, but this one really captured my heart! It’s also very good for those old fashioned dishes like lamb’s head and pig’s trotters. 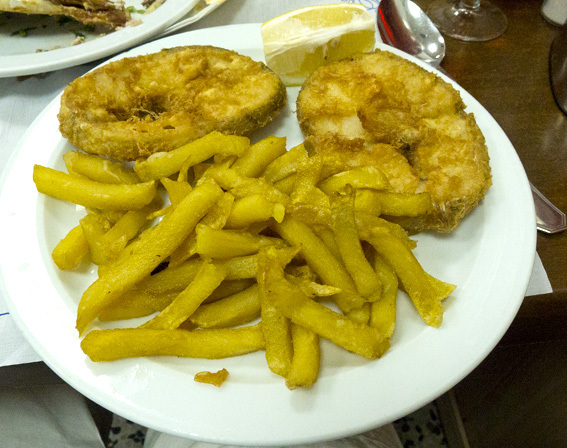 Oli and I had chicken croquetas (again – they are good here) with allioli (that spectacular Catalan alternative to mayonnaise) and more berenjenas fritas (fried aubergine), as starters. 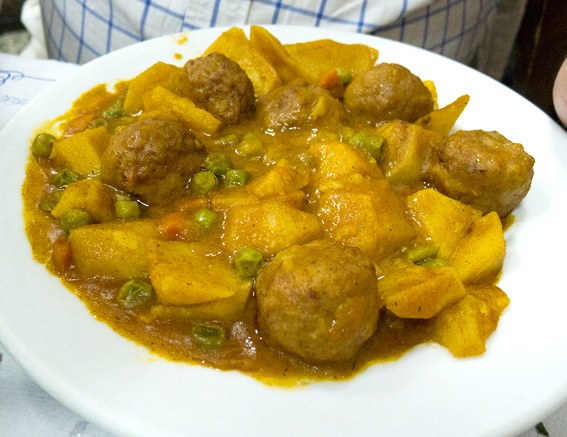 had some delicious albondigas (meatballs), in a sauce with vegetables. 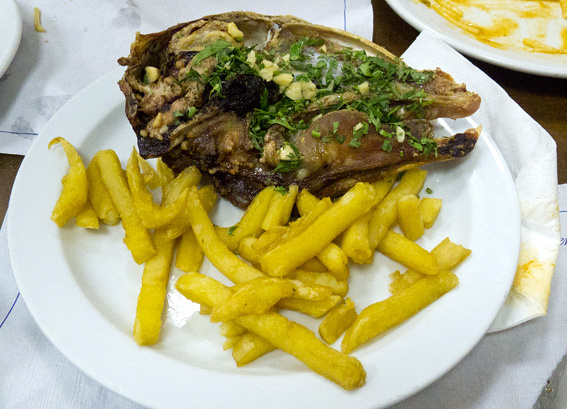 As a side order we had a cabeza de cordero (lamb’s head) cooked with garlic and parsley – there’s not much meat on it, but the brains were delicious along with the eyeball! After paying, we were treated to shots of Spanish brandy on the house, in a fantastic new Barcelona institution, the chilled glass – this, alongside an air conditioned Metro, make Barcelona a perfect city to live in, while the rest of the world melts each summer. 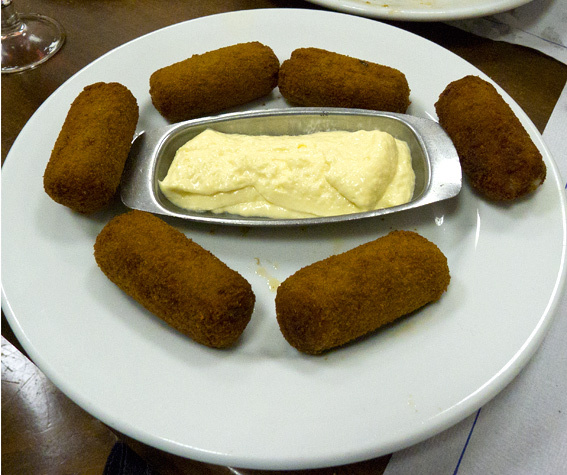 This entry was posted in Barcelona, Barcelona Bars and Restaurants, Eating Out, Fish, Food, Meat, Restaurants, Spanish and tagged albondigas, allioli, berenjenas fritas, cabeza de cordero, croquetas, hake, lamb's brains, merluza, restaurant, Romesco. Bookmark the permalink. You are eating all my favourite things! 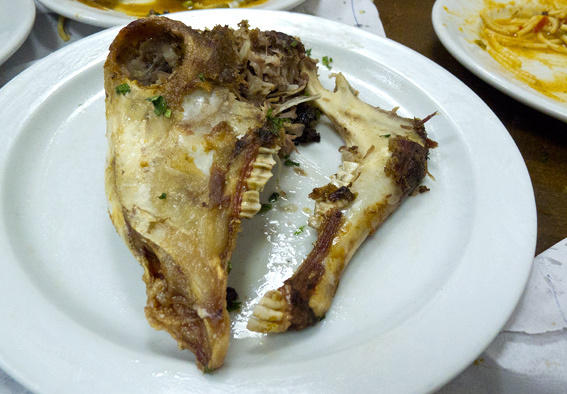 We also eat quite a lot of goat´s head at home as the local goatherds give them to us when they sell the goats to the locals – delicious!